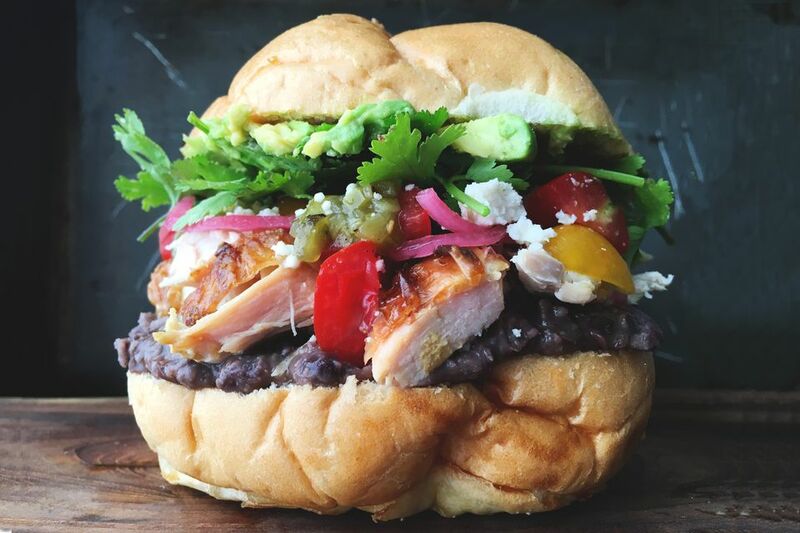 Pulled rotisserie chicken, chipotle black bean spread, tomatoes, pickled red onions, queso fresco, salsa verde, cilantro and fresh avocado are piled up in a hollowed out torta bun to make a healthier version of this Mexican classic. Just don't forget to ditch the mayo which adds unwanted calories. Instead, we recommend trying our creamy chipotle black bean spread which is made by mashing up black beans with lime juice and the liquid from chipotle peppers. This blend creates a rich and delicious sandwich spread that's not only super healthy but is absolutely delicious on sandwiches and more. The crushed up avocado also mimics the rich creaminess of mayo but is packed full of healthy fats that are muy bueno for you! Cut your torta in half and gently pull out the interior of the bun so that most of the bread is removed. Heat the hollowed torta in the oven for a few minutes. Meanwhile, use a fork to mash together black beans, chipotle liquid, and lime. Remove the torta from the oven and smear on the chipotle black bean spread on the bottom half. Place the pulled rotisserie chicken on top of that and add tomatoes, pickled red onions, queso fresco, and salsa verde. Mash 1/4 an avocado on the top half of the torta and push the cilantro into it. Close the sandwich and serve within the hour. Mexican Pot Roast: Make This for Date Night Taco Tuesday!